Add watermarks to multiple photos in the batch mode! Total Watermark is a convenient and powerful solution that helps you protect your photos and images with watermarks. The software allows you to create templates of any complexity using text and images, apply various effects to them, including shade, translucency, gradients, contours, and much more. It supports a wide range of image formats and carries functionality for handling EXIF and IPTC data. The intuitive interface of our watermark software makes it accessible to both amateurs and professional photographs and designers. Batch watermarking of photos and images will help you get rid of the routine and automate handling of any number of files. It is now really easy to protect your copyright using this program! Try it! 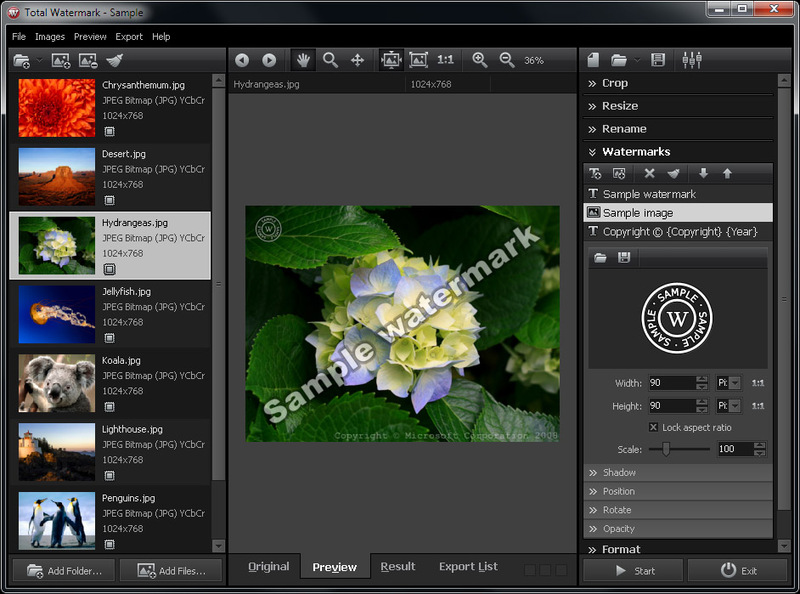 Our watermark software is the best solution for designers and photographers. It allows creating watermarks from text, graphics and images, saving them as templates and applying to any photographs or images in the batch mode. This relieves you from the tedious routine of applying watermark to images by hand, speeding up the operation dramatically. With this program, you can quickly protect your photos with copyright by imposing visible watermarks and thus making it practically impossible to illegally use your images by unauthorized persons. Creating templates in the application is extremely easy. You can use text and graphic logos, specify all kinds of parameters: position, transparency, pitch, font, color, etc. When creating templates, you can also use the EXIF and IPTC data from your shots, which is very common to photographers. Once the watermarks are applied, the program can save the photos in a variety of formats, allowing you to choose the best one for the moment. Besides its primary function, our application provides you with the basic photo editing and album creation functions. You can quickly rename your photos in the batch mode. Select the required files and specify the name and the required format. That's it! Resize your photos and images for publishing on the Web. Optimize the size of your images for e-mail, websites or blogs. Discard all the excess from your pictures and keep only the desired stuff! Your images will become compact and much more interesting. 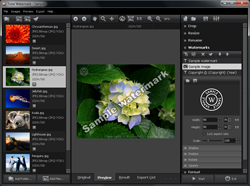 With Total Watermark software, you can do that quickly and with ease. Choose the best format settings for your photographs. Watch the result as you adjust the quality of the images to be exported! Publish your photos to most popular social networks. Sign in to your account or enter the ftp connection settings once, and easily publish your photos with watermarks applied with a single click.